The Film You’ll Never Live To See! A recently discovered film by a group of young film students that catalogues their struggles during the first three days of the Zombie apocalypse. Rather than a reflection on recent events, this FanEdit tries to to follow the unfolding events in real time. Also the editing tries to translate an unpredictable and discomposed viewing experience. This FanEdit is inspired by George A. Romero. I will let you be the judge if this works or not. Numerous cuts and additions were made that are not listed. The original release was OK, but quite a disappointment considering what it might have been (the premise and who was behind it). This fanedit is a substantial improvement over the theatrical release, though I must add my voice to those that feel too much has been cut in terms of character development. Still, since this is a zombie flick I probably would not have come back too unless coerced, I must say I was pleasantly surprised. Well done. 7/10. 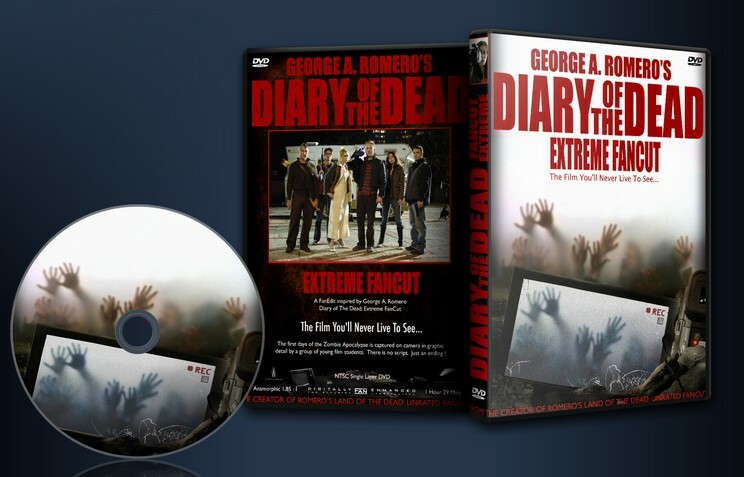 Although some news footage inserted into the main story is distracting, it is still much better than the original Diary of the Dead. The only thing that really seems out of place is a couple of instances of fast moving zombies. Overall, the faster pace and no boring/crappy narration is a huge improvement over the original. I did kind of miss the blonde texan chick’s character development, as I came to really like her in the original, but it’s all for the best. As boon stated, points are lost on the presentation. I finished watching this fanedit this afternoon, but did not have the time to comment on it yet – also was not sure what to write. However, the comment/review by Istvan6 on fanedit.org makes me want to write down my own impressions. I have a split opinion when it comes to Mollo fanedits. This does not mean that they are not all great for someone else, but for me they are sometimes terrific and sometimes not so terrific. I am a huge fan of his LAND OF THE DEAD fanedit – and it is still one of my favorite fanedits of all-time. Now Mollo is back to editing Romero – and of course I was excited about this. I did not hate DIARY OF THE DEAD as much as LOTD, but it was an unimportant movie, which I easily could and also wanted to forget about. Some neat shocks, some interesting stuff from the zombie universe, yet nothing innovative, some truly bad acting, some truly bad scenes. The most amateurish movie Romero ever made. His attempt to jump on the “docu-live-footage” train in the spirit of Blair Witch, Cloverfield, REC and now Paranormal Activity is weak, because his actors did hardly ever behave like real people. 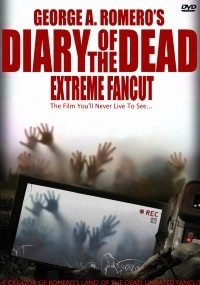 So I sat down and watched “Diary Of The Dead: Extreme FanCut”, not sure what Mollo could have done to it, because I had not read the list of changes to have an unspoiled watching experience. My biggest disadvantage when watching this fanedit is that I am a zombie buff. Mollo mixed a lot of sources and I discovered and recognized them all so easily. It was a tough one to get into the movie and sense its own atmosphere, when it contained so much known footage. The beginning has a lot of scenes from News reports – and these soon raise the one question, who actually edited that video. This question remains active for the most part of this fanedit and it does not get answered. The students, who are obviously the leading characters of the movie film their own documentary. It is nowhere said that they combined it with other news. The news reports have very different quality and aspect ratio, which I think should have been corrected for a more consistent viewing. Also the news reports are in the way I got it, often more progressed in the action than the students. When finally after a few minutes the students appear for the first time on their c-horror film set, they also hear news, which are describing the awakening dead as a mistake, which contradicts what was shown in the news reports before. There are lots and lots of breaks throughout the beginning (and later on). Mollo uses them as a style to make the footage appear even rawer than it originally was. But why do some of the student scenes have score? I know this was a critique of the original movie as well, but in this case it gets even more obvious and feels even more wrong. The students get into the van and start their ride, the zombie action starts pretty soon with a burned cop zombie and 3 people who were run over by the car, which was obviously not the one of the students, especially because the scene was not properly introduced to make the driver#s reason to just and without breaking run them over plausible. Plausibility is one of the weaknesses of this fanedit anyway. A lot of scenes were cut and by this also took away the life and motivation from the characters. The interruptions by the news reporters also took away from the “live” atmosphere. I found the first 30 minutes of this movie confusing and a bit boring. Too much reports, not enough of the students. This gets better later on. The more we see of the students, the better the fanedit is and I for one was able to stay entertained enough to enjoy some parts – especially when they are at the one girl’s home and she gets attacked by her brother and mother. The barn scene with the farmer before was weird, because the farmer was not introduced at all and dies without having said a single word. This felt wrong. The ending worked kind of well and kept me entertained. I enjoyed the beginning of the end credits that were too long in the end for me to stay put. So, while this edit does have a lot of flaws and inconsistencies I see it also as a great experiment that kept me entertained. It is not superior to the original, yet I consider it not a waste of time for a zombie fan to give it a watch. editing: 7 of 10 (a lot of forced cuts that were meant as a means of style, but did not work for me. Some inconsistencies in the plot, some news footage contradicts the Romero universe (“some lose the ability to speak”, running zombies), end credits were too long). audio quality was great. Mollo is an audio specialist and it shows. I did not like the additional Dawn Of The Dead music, but it was ok, where it was. This release is barebones with cover art. No menus, no extras. Nice starting and end credits. The music was a bit too loud on the end credits. The info on FE was quite detailed and comes with a nice trailer. 10 stars maximum -3 for missing menus, -2 for missing extras. A lot of room for a better presentation, especially the menus were really missed. Info, cover art, trailer and credits were nice. This could have easily been great. This can be enjoyed by Zombie and Romero fans.